The Albert Park circuit is a temporary track which is only used once a year to host the Australian Grand Prix - typically the opening round of the season. The track made up of sections of the public road that circles the man-made Albert Park lake. The sections used were completely rebuilt in 1996 to ensure consistency and smoothness of the surface and, as a result, it is considered the smoothest of the road circuits currently in use. Although fast, the track is thought of as to be easy to drive, although the flat terrain around the lake combined with the design means the circuit has very few proper straights making overtaking particularly hard. Despite talks of a night race to make viewing easier for Europeans, a compromise was reached between the FIA and the race organisers and the 2009 race started at 5pm local time and proved a great success. 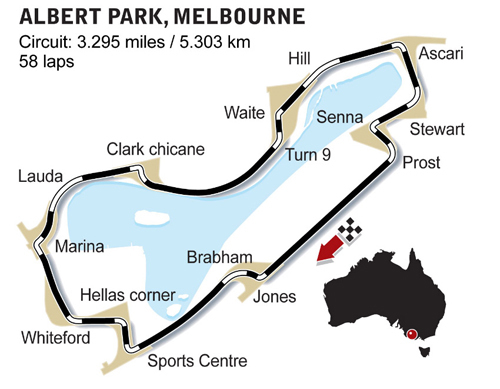 As a result the contract was extended, meaning Albert Park will host the Australian Grand Prix until 2015. In 2001 marshal Graham Beveridge died after being struck in the chest by a flying wheel. His death lead to the introduction of wheel tethers in F1.